Most people depicted in this picture are easy to identify. In the background, we see Lautrec himself walking next to his lanky cousin Gabriel Tapie de Seliran; to the right of them – the dancer La Gulya, adjusting her hair in front of the mirror. At the table sit regular visitors to the nightlife of Montmartre. Maillie Milton, who was struck by the strange light of the face of the English dancer, was not originally in the picture; it appeared after in 1895 Lautrec added several stripes of canvas to the right half of the picture. Thanks to these changes, the composition of the picture became more unexpected and dynamic, approaching the compositions of Degas and Japanese prints – all this at that time Lautrec was fascinated. 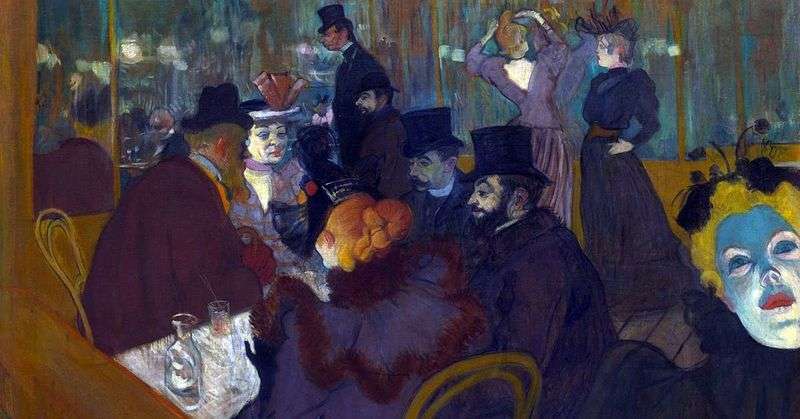 The painting is very lively and conveys the exciting atmosphere of the Moulin Rouge. Description and meaning of the painting In “Moulin Rouge” by Henri de Toulouse-Lautrec.